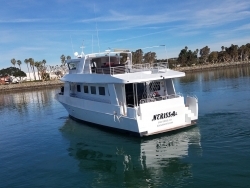 San Diego, CA, March 05, 2018 –(PR.com)– The Zolna’s were looking for just the right 49 passenger vessel for several years. Scouring boats for sale directories all over the country and beyond to find just the right vessel that would meet the strict Coast Guard requirements to charter 49 passengers, and, fit in their budget. In the spring of 2016 they found her in Gulf Shores Alabama. According to Shari, co-owner of Zolna Yachts, “I knew this yacht could someday be gorgeous, but realized we had a very long road ahead of us. The yacht was so dated, poorly designed for our specific charter yacht purposes and had no design flow. Because of all my years of experience doing fixing and flipping of real estate, I could see that the hull and the size of the vessel was right. However, we would need to totally demolish the interior and some of the exterior and start from scratch.” And so they did. After the long journey from Alabama, around the Keys of Florida and up to Fort Lauderdale, the yacht was loaded onto a carrier ship and sailed to Mexico, where she was unloaded and brought to the final destination, San Diego. Nerissa is a 73 ft Bonner Navigator Motor Yacht. Zolna Yachts pulled out all the stops in her design. The motif is modern contemporary with extraordinary details including custom walnut woodwork throughout, a lighted quartzite bar, stunning furnishings, a professional sound system, multiple outdoor sundecks plus a bubbling hot tub. Zolna Yachts accommodates all types of events from small intimate groups to larger corporate gatherings. They provide a choice of caterers, have a top notch professional crew as well as a bar tender. Zolna Yachts have served southern CA for 12 years and all their vessels are located on Harbor Island. Take a peek at this latest edition to their fleet and view some of the photographs of this beautiful and luxurious yacht.